In many ways, selling a stock is a tougher decision than buying one. A quick look around Google, however, reveals far more articles about how to buy stocks rather than how to sell them. We've already discussed reasons for selling, so we'll focus on three strategies we can employ today that can help us get better at selling stocks. Do a "pre-mortem" before buying: One of my favorite questions to ask someone pitching a stock is, "If the stock price falls 30%/40%/50%, what happened?" While a weak market may certainly play a role in any stock's decline, the point of the question is to determine what could go wrong at the company-level -- new competition, a failed product, a bad M&A deal, etc. If you can determine what might go wrong before things actually do go wrong, you'll be in a much better position to recognize a deteriorating thesis and sell at a good price. Review every sale decision, regardless of outcome: With every investment comes at least one valuable lesson that you can then apply to your decision-making process. As such, review each closed investment and determine what went along with your expectations, what didn't, and where you could have been more thorough in your research or decisions. Here's an example of this strategy. Create a "sold portfolio" and track its performance: Give this a try. Create a Google Spreadsheet (like this one) and track the performance of your sold stocks versus an appropriate benchmark. If you find that your portfolio of sold stocks has consistently outperformed the market -- or even your ongoing portfolio's performance -- it's time to reevaluate your selling strategy. Note that this effort will take some time to bear fruit as longer-term performance (at least 3 years) will be more telling than short-term results, which can be influenced by luck. You'll notice that the common thread among these three strategies is to keep good physical records of your decisions. That's the key to improving any decision making process as it reduces hindsight bias (i.e. "I knew this all along") and conservatism bias (i.e. being slow to incorporate new information or clinging to prior views). It's not an oversight that I didn't recommend stop-losses as a way to improve your selling process. They're probably great if you're trading stocks, but they aren't great if you're investing in stocks. If you've done your homework, are comfortable with your thesis, and believe you paid a good-to-fair price for a competitively-advantaged and well-run company, why should it matter if the stock price temporarily falls 10%? Put another way, don't let the stock market be a distraction to the business of investing. Admittedly, ignoring stock price fluctuations is easier said than done. So rather than executing a trade at a certain percentage price decline, try setting up an alert (via email, text message, etc.) if the stock price crosses that level. Then, take 24 hours to review your thesis and make a decision. Ready, aim, fire makes a lot more sense than ready, fire, aim. As the saying goes, the most valuable investing lessons are learned from observing other investors’ mistakes. Well, have an investing lesson on me, as I’ve made a pretty decent mistake in my portfolio. Earlier this week, I made the very difficult decision to close my three year investment in UK-based grocer and retailer, Tesco plc (LON: TSCO) and realized a 22% loss on capital -- just the type of permanent loss that we're trying to avoid. Granted, the generous income return from the Tesco investment lessened the sting of the capital loss, but the investment performed poorly on an absolute basis -- and even more so if we’re measuring it relative to the market. These things happen, though. Let's at least learn something from it. Looking back, my original thesis was reasonable. Tesco had steadily increased its dividend each year for well over a decade, margins stayed in a tight range, the new management team seemed capable, etc. The trouble started a year or so into the investment when I didn’t follow my own selling advice and held on while the thesis deteriorated. Two prongs of my initial thesis on Tesco were that the company’s mis-timed expansion in the U.S. (Fresh & Easy) would eventually stabilize and rebound as the U.S. economy recovered -- particularly in the western states where the stores were located. Further, I thought Tesco’s investments in China would fuel earnings and dividend growth for years to come. Neither of these things worked to plan. In April 2013, Tesco announced it was exiting the U.S. market and Fresh & Easy filed for bankruptcy protection. All of this resulted in a over a billion dollars in trading losses and impairments. That in itself should have been a sign to sell. I rationalized, however, that with the Fresh & Easy chapter finally shut, Tesco could better focus on its other global operations. Tesco also never figured out how to turn a steady profit in China. Ultimately, Tesco entered into a joint venture with a large Chinese retailer who actually knew how to run a retail business in China. So much for the region fueling dividend growth. With Tesco’s focus on its struggling international operations, it began losing ground to competitors in its home market. Indeed, a space race/pricing war erupted between Tesco and other U.K. grocers like Sainsbury's and Morrisons. Meanwhile, discounters and higher-end grocers feasted on the opposite ends of the spectrum. Even though Tesco seemed best suited to survive his war of attrition, profit margins have suffered. This put further strain on both free cash flow- and earnings-based dividend cover. In response, Tesco’s held its dividend flat for the last two years and recently abandoned its profit margin target. As an aside, when I first invested in Tesco, two of my favorite investors (Neil Woodford and Warren Buffett) owned the stock. Buffett even increased his stake a few months after I invested, which I believed supported my thesis. Around the same time, however, Woodford was paring his investment in Tesco after owning the stock for well over a decade. (Buffett would later reduce his holding, as well). I might have paid too much attention to this factor. Certainly having top-notch investors on the same side of an investment can be reassuring. They've also done the research and think this particular stock is a good investment. Still, it's important to remember that their motivations for owning the stock could be very different from yours. The purpose of the Clear Eyes Investing blog is to promote long-term and patient investing. It’s important, however, not to confuse patience and hope. In investing, patience is allowing the companies in your portfolio (that you bought at good-to-fair prices) to compound returns through their advantaged business models. Hope, on the other hand, is a wish or desire for something to occur when the fundamentals don't add up. I fear I may have been “hoping” for a Tesco turnaround a bit too long. There’s little point in hoping that a stock price will return to your cost basis if new information suggests otherwise. As such, it's important to revisit and refresh your assumptions every so often. *Just noticed the typo -- should be column and row, not column and column. This is an admittedly simple valuation model, but it does suggest that even at 290p per share, Tesco may not be cheap right now. That's certainly the case if the company doesn't resume mid- to high-single digit annual dividend growth. 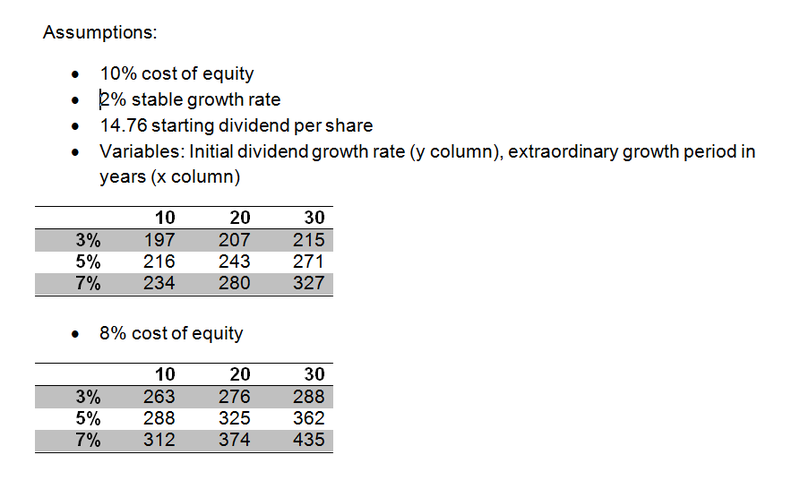 And a resumption of dividend growth seems unrealistic considering Tesco's current yield over 5% (~1.7 times the market average), lack of free cash flow cover, and no apparent end to the UK grocer pricing war. I don’t see any reason why Tesco will have the desire nor the financial ability to restart its dividend growth in the near future. As a check on my dividend outlook, I plugged Tesco’s most recent financials into the Dividend Compass. I wasn’t impressed by the results as the score has declined to very low levels. In recent years, Tesco's supported its dividend through real estate monetization (i.e. sale and leaseback arrangements, etc.) and not via free cash flow generated through operations. Put simply, that’s not a sustainable strategy. 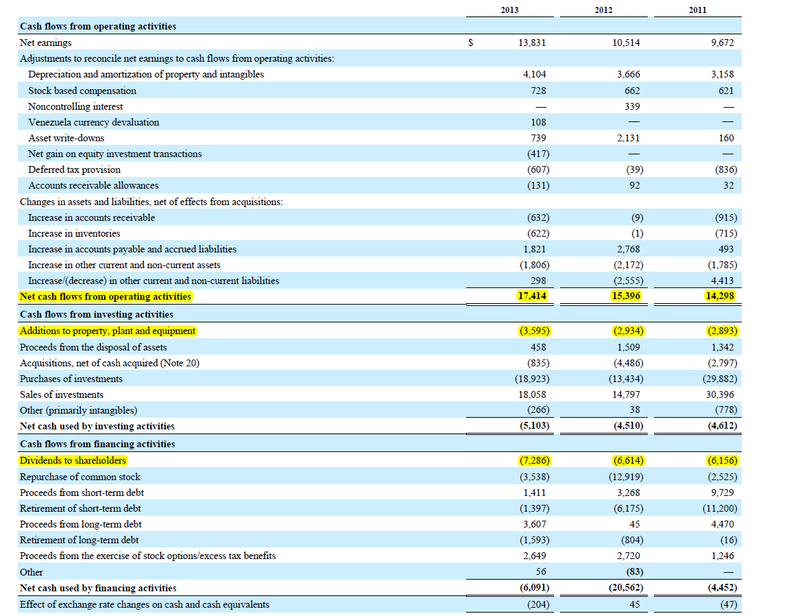 Tesco’s dialing back capital expenditures in the next few years to improve free cash flow, but it’ll also need to grow cash flow from operations if it’s going to consistently cover the payout with free cash flow. Tesco’s closest peers like Sainsbury's and Morrisons are also trading with dividend yields over 5% and I have some concern that if one of them decides to cut their payout, the others will be more inclined to follow suit. Tesco shares may in fact turn around and I might be wrong in selling here, but fresh analysis suggests it’s the right move. Time will tell, of course, and I'll look to reallocate my cash elsewhere. At the very least, I hope my financial loss provides some valuable lessons and that we can use them to improve our investment processes. When you find yourself making a lot of excuses for a company’s missteps, it’s time to reevaluate your investment thesis. Remember, you don’t work for the company and there’s no reason to spin bad results in a positive light. Call them as you see them. If a company holds its dividend flat after years of steady growth, it’s likely a sign that the competitive landscape and/or company’s strategy has changed. The board and management are clearly not confident in their medium-term outlook. Something is up. When figuring out when to buy or sell a stock, don’t concern yourself with which investors are also buying or selling the stock. Fund managers with large assets under management can have very different investment criteria and objectives than you and I do. They can also make mistakes like anyone else. Forget the price you paid for the stock. The question you need to answer is, “Would you buy the stock today?” Anchoring is a powerful behavioral bias. To combat anchoring, write down your original thesis and periodically review it and update your assumptions. Has anything materially changed? Even a solid research process can have a poor outcome. On average and over time, a good process should yield better results, but on a case-by-case basis this isn’t always true. Learn from the poor outcome and move onto the next investment. Please post any questions or comments you have in the comments section below. A 1929 article about one of my great-grandfathers who was a beloved street car operator in Cincinnati. While researching a dividend paying stock should be a holistic process and buying decisions shouldn't be based on any single metric, if there's one metric that every dividend investor should know, it's free cash flow cover. After all, an income investing strategy doesn't work without income, so before you purchase any dividend stock, it's absolutely critical to know whether or not the dividend is sustainable. That is, can the company afford its current dividend through cash flows from operations? You also want to know whether or not the company can grow its dividend in the coming years. Free cash flow cover can help you answer both in ways that other common dividend analysis metrics -- earnings cover, various balance sheet ratios, etc. -- cannot. Many companies and investors primarily focus on earnings cover (earnings per share/dividends per share or net income/dividends paid). As such, earnings cover is also important to consider, but "earnings" are simply an accountant's opinion of the company's profits and not necessarily a good measure of cash flow. In fact, a company can have sufficient earnings cover but negative free cash flow cover. Because dividends are paid in cash, we want to use a metric that helps us measure cash inflows and outflows. That's what the free cash flow cover metric can do. Free cash flow is how much cash flow is left over each year after the company has reinvested in its business. Think of it as spare or surplus cash flow. It's from these surplus cash flows that dividends, buybacks, debt repayments, etc. are funded. To illustrate the concept, let's have a look at Johnson & Johnson's most recent cash flow statement. As we can see, since 2011 Johnson & Johnson's free cash flow cover has been between 1.85 and 1.9 times. Great, but is this a good ratio? Indeed it is, for it's telling us that for each $1 Johnson & Johnson pays out in dividends, it generates between $1.85 and $1.90 in free cash flow. Free cash flow cover can be thought of as your dividend "margin of safety" or "margin of error" -- and, all else equal, the higher the ratio, the more secure you can consider the current payout and the more likely the dividend can grow in the future. Conversely, a firm with a free cash flow payout ratio near or below 1 times has very little margin for error if it aims to maintain its current dividend. If it falls on a rough year, the dividend might be on the chopping block. A company with low or non-existent free cash flow cover could support the payout for a while using alternative financing (borrowing, selling assets, etc. ), but that's an unsustainable solution. Eventually, the firm will need to generate free cash flow from operations to support the dividend. A good rule-of-thumb is to look for free cash flow cover above 1.5 times. As with any rule, there are exceptions and much will depend on the company's stage in its lifecycle and the stability of its business. A smaller firm that's still reinvesting large amounts in the business may have a very high free cash flow cover while a utility firm might reasonably pay out close to all of its free cash flow each year. Still, I think any free cash flow cover below 1.5 times is worth further investigation. Does the company have other financial resources (a good balance sheet, etc.) to support they payout in the event of a bad year? Is demand for the business's products stable enough to sustain such a high free cash flow payout? As I noted earlier, free cash flow cover shouldn't be the only metric you consider before buying a dividend stock, but it's the most important one to consider as it tells you the most about the company's dividend policy and generates many additional questions that need answering before an investment is made. For this reason, free cash flow cover has the highest weight in my Dividend Compass rating system. You can download a copy of my Dividend Compass spreadsheet completely free by clicking here. Once you're in the Google Doc, click File>Download As>Excel and you can begin customizing it. All you need to do is enter the simple financial information found on the company's most recent annual report, click on the inputs tab, and see the company's Dividend Compass rating (5 being the best, 1 being the worst). My apologies for having to manually enter the data. One day I'll get a data feed and have it automatically load with a change in ticker! If you have any questions about free cash flow cover, the Dividend Compass, or dividend investing in general, please post them in the comments section below. To defenders of the efficient market hypothesis and "rational" markets, dividend-focused strategies can seem to be irrational and an anomaly. Some behavioral economists even chalk dividend strategies up to investor biases such as loss aversion, regret avoidance, and an inability to delay gratification. Yet somehow dividend investing works and has worked over generations and across markets, as investment adviser Tweedy, Browne shows in its papers "The High Dividend Yield Return Advantage" and "What Has Worked in Investing". I've also personally seen it work for many individual investors and in my own portfolio. In his 2012 letter to shareholders, Warren Buffett made a compelling case as to why Berkshire Hathaway doesn't pay a dividend. Dividend critics often point to Buffett's comments as support for their argument. What these critics miss, however, is that Buffett was only referring to why his particular company doesn't pay dividends. Berkshire doesn't pay dividends, Buffett reasons, because he thinks he can manage the capital better than shareholders -- and most would agree with him. Buffett certainly doesn't mind receiving dividends from his portfolio holdings, with most of his largest holdings (Coca-Cola, Exxon, Sanofi, etc.) paying very ample dividends each year. That's because he takes the dividends and reinvests them where he sees the best opportunities. The fact is that few management teams allocate capital as effectively as Buffett does. As such, they should only have capital they need to reinvest in value-enhancing projects. All extra cash should be returned to shareholders. In addition, by having a certain amount of earnings earmarked for dividends each year, management teams need to focus on investing the remaining capital in an efficient manner. The historical evidence strongly suggests that expected future earnings growth is fastest when current payout ratios are high and slowest when payout ratios are low....Our evidence contradicts the views of many who believe that substantial reinvestment of retained earnings will fuel faster future earnings growth. Rather, it is consistent with anecdotal tales about managers signaling their earnings expectations through dividends or engaging, at times, in inefficient empire building. By investing in firms that pay out a meaningful portion of earnings each year as dividends, then, investors are reducing the risk that management will mis-allocate the capital toward empire-building or value-destructive acquisitions and buybacks. As Benjamin Graham noted in Security Analysis, "a dollar is worth more to the stockholder if paid him in dividends than when carried to surplus [by the company]." I'd much rather have some of the firm's earnings in my pocket each year than leave it all in the company's coffers. If that money is going to be subsequently misspent, I'd rather it be my own fault than someone else's. Further, when you invest in a firm that doesn't pay dividends, the only cash flows you can see are the ones the company's accountants says it has. Problem is you can't actually touch any of that cash. Dividends, however, need to be paid in cash and can't be faked. At least for very long. Firms that are able to consistently generate enough cash to commit to a dividend and are confident enough to raise their payout each year are probably doing something right. A progressive dividend policy also shows a company's shareholders that it views them as partners in its prosperity. Finally, it may be irrational by traditional finance standards, but focusing on the income return naturally shifts attention away from the short-term price volatility that often causes investors to trade too frequently -- and usually at precisely the wrong time. If focusing on dividends helps investors bear through difficult markets when they would have made emotional trading decisions and racked up high transaction costs in the process, well, I don't see much wrong with that. Don't get me wrong, total return (capital gains plus income growth) should be the primary long-term objective, but if you can consistently identify quality firms that can grow their payouts each year and buy them at a good-to-fair price, the capital gains should take care of themselves. You won't find this in any finance textbooks, but dividend investing works precisely because it encourages investors to think like investors -- that is, focus on buying good companies (poorly-run companies can't sustain high dividend growth for very long) at good-to-fair prices and hold them patiently. Sure, you could do the same with a strategy that doesn't include dividend-paying stocks and sell partial stakes to generate "dividends" as needed. That's much easier said than done, of course, as it requires nerves of steel and a high level of trust that the companies are allocating your capital better than you can. Dividend investors may indeed be irrational, but I'm content being the irrational guy patiently letting my dividends roll in from well-run companies that I bought at a good price. What do you think? Please let me know in the comments section below.